World-class money managers like Ken Griffin and Barry Rosenstein only invest their wealthy clients’ money after undertaking a rigorous examination of any potential stock. They are particularly successful in this regard when it comes to small-cap stocks, which their peerless research gives them a big information advantage on when it comes to judging their worth. It’s not surprising then that they generate their biggest returns from these stocks and invest more of their money in these stocks on average than other investors. It’s also not surprising then that we pay close attention to these picks ourselves and have built a market-beating investment strategy around them. Is BioMarin Pharmaceutical Inc. (NASDAQ:BMRN) a cheap investment right now? The smart money is taking a bearish view. The number of bullish hedge fund positions decreased by 3 recently. Our calculations also showed that BMRN isn’t among the 30 most popular stocks among hedge funds. BMRN was in 37 hedge funds’ portfolios at the end of the fourth quarter of 2018. There were 40 hedge funds in our database with BMRN positions at the end of the previous quarter. If you’d ask most stock holders, hedge funds are perceived as worthless, outdated financial tools of yesteryear. While there are more than 8000 funds trading at present, We hone in on the leaders of this club, around 750 funds. It is estimated that this group of investors direct most of the smart money’s total capital, and by observing their highest performing stock picks, Insider Monkey has revealed numerous investment strategies that have historically outpaced the S&P 500 index. Insider Monkey’s flagship hedge fund strategy beat the S&P 500 index by nearly 5 percentage points per annum since its inception in May 2014 through early November 2018. We were able to generate large returns even by identifying short candidates. Our portfolio of short stocks lost 27.5% since February 2017 (through March 12th) even though the market was up nearly 25% during the same period. We just shared a list of 6 short targets in our latest quarterly update and they are already down an average of 6% in less than a month. We’re going to take a gander at the fresh hedge fund action regarding BioMarin Pharmaceutical Inc. (NASDAQ:BMRN). How are hedge funds trading BioMarin Pharmaceutical Inc. (NASDAQ:BMRN)? At the end of the fourth quarter, a total of 37 of the hedge funds tracked by Insider Monkey were long this stock, a change of -8% from one quarter earlier. 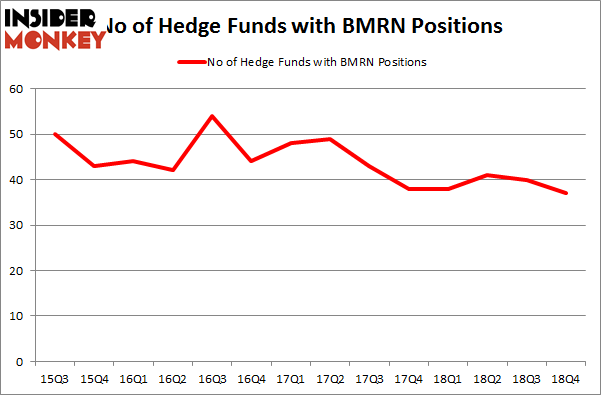 On the other hand, there were a total of 38 hedge funds with a bullish position in BMRN a year ago. With the smart money’s capital changing hands, there exists an “upper tier” of noteworthy hedge fund managers who were increasing their stakes significantly (or already accumulated large positions). More specifically, Baker Bros. Advisors was the largest shareholder of BioMarin Pharmaceutical Inc. (NASDAQ:BMRN), with a stake worth $646.2 million reported as of the end of September. Trailing Baker Bros. Advisors was Viking Global, which amassed a stake valued at $433.6 million. Palo Alto Investors, venBio Select Advisor, and Citadel Investment Group were also very fond of the stock, giving the stock large weights in their portfolios. 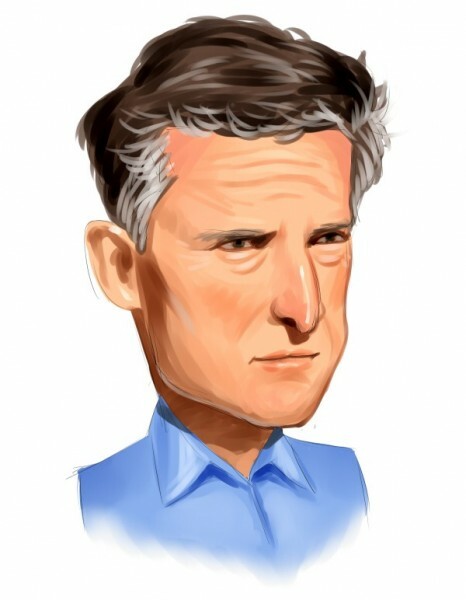 Judging by the fact that BioMarin Pharmaceutical Inc. (NASDAQ:BMRN) has experienced declining sentiment from the aggregate hedge fund industry, it’s safe to say that there lies a certain “tier” of hedgies that slashed their positions entirely heading into Q3. At the top of the heap, Andrew Weiss’s Weiss Asset Management said goodbye to the largest position of the 700 funds watched by Insider Monkey, totaling close to $28 million in stock, and Jason Karp’s Tourbillon Capital Partners was right behind this move, as the fund said goodbye to about $14.3 million worth. These bearish behaviors are intriguing to say the least, as aggregate hedge fund interest dropped by 3 funds heading into Q3. Let’s also examine hedge fund activity in other stocks – not necessarily in the same industry as BioMarin Pharmaceutical Inc. (NASDAQ:BMRN) but similarly valued. These stocks are TAL Education Group, Inc. (NYSE:TAL), Continental Resources, Inc. (NYSE:CLR), NetApp Inc. (NASDAQ:NTAP), and Pembina Pipeline Corp (NYSE:PBA). All of these stocks’ market caps resemble BMRN’s market cap. As you can see these stocks had an average of 23.75 hedge funds with bullish positions and the average amount invested in these stocks was $539 million. That figure was $1854 million in BMRN’s case. Continental Resources, Inc. (NYSE:CLR) is the most popular stock in this table. On the other hand Pembina Pipeline Corp (NYSE:PBA) is the least popular one with only 14 bullish hedge fund positions. Compared to these stocks BioMarin Pharmaceutical Inc. (NASDAQ:BMRN) is more popular among hedge funds. Considering that hedge funds are fond of this stock in relation to its market cap peers, it may be a good idea to analyze it in detail and potentially include it in your portfolio. Our calculations showed that top 15 most popular stocks among hedge funds returned 19.7% through March 15th and outperformed the S&P 500 ETF (SPY) by 6.6 percentage points. Unfortunately BMRN wasn’t in this group. Hedge funds that bet on BMRN were disappointed as the stock returned 11% and underperformed the market. If you are interested in investing in large cap stocks, you should check out the top 15 hedge fund stocks as 13 of these outperformed the market.